The bull market died on Monday. That shouldn't be a surprise to most folks. The bull was on life-support for the past two months. And it was just last month when we warned that the bear was headed our way. Longtime readers know I use the 20-month exponential moving average (EMA) line on the S&P 500 as the defining line between bull and bear markets. If the S&P 500 is trading above the line, then stocks are in a long-term bull market. If the index finishes below the line at the end of any month, then the bear is in charge. On Monday, the S&P closed the month of December below its 20-month EMA. The bull market is over. Stocks have entered a new bear market. 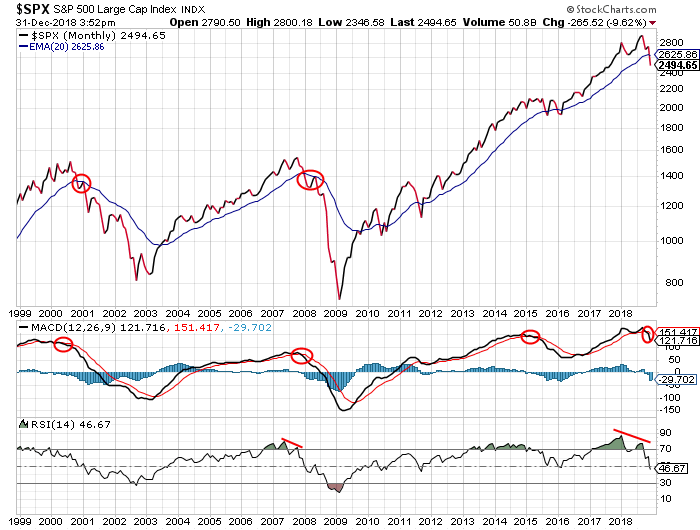 You can easily see how the bear markets of 2001 and 2008 kicked off when the S&P closed below its 20-month EMA. MACD and RSI technical indicators were not "overbought." So, there wasn't much fuel in the tank to keep a bear market energized. We had another false signal in 2015. This time, both the MACD and RSI indicators were rolling over from overbought conditions. So, we had all the makings of a strong bear market. But, the market had other plans. The S&P 500 lost ground in 2015. But, the index recovered from its brief dip below its 20-month EMA. And, it rallied – almost non-stop – for the past three years. So, I suppose the bulls can point to the action in 2015 and argue we'll see something similar this time around. That's a valid argument. If the S&P can reverse and close back above its 20-month EMA (at the end of the month) then we can concede that the recent action is nothing more than a correction. But, I'm not that optimistic. The technical setup today looks eerily similar to 2007/2008. The sharp, sudden rise in longer-term interest rates, the peak in investor margin balances, the erratic shifting of investor sentiment, the large ramp higher in volatility, and the S&P's decline below the 20-month EMA all suggest we're in the early stages of a prolonged bear market. Stock prices will be lower one year from now than where they are today. But, one month from now, we'll probably be higher. If you look at the action in 2001 and 2008, you'll notice that after the S&P 500 closed sharply below its 20-month EMA, it then rallied all the way back up to retest the former support line. We're probably going to see something similar happen this time around. That gives us an upside target of about 2625 over the next few weeks. That would be a 5% gain in about a month. I like the odds of that happening, and I've added long exposure in anticipation of just such a "snap-back" rally. But, I'll be exiting the long trades and adding some short exposure as the S&P rallies back up to that level – and especially if the various technical indicators reach extremely overbought levels. The bull market had a wonderful, long life. But, it's over now. The bear is in charge. Traders should anticipate a move higher over the next few weeks, if only to relieve the severe oversold conditions caused by the recent harsh decline. But, the primary trend of the market has changed. Most stocks are likely to be lower one year from now than where they are today. Take advantage of a rally this month to lighten up on long positions and maybe add a little short exposure.